This year’s U.S. Presidential elections have been unusually energetic and polarized. One might attribute this fact to the unusual, energetic, and polarizing personality and candidacy of Republican nominee Donald Trump. But much like Democratic candidate Bernie Sanders, Trump is unlikely to have garnered such strong interest unless the U.S.’s basic political coalitions were not themselves especially polarized and far from the country’s political center right now – and perhaps near or at the end of a period of realignment and consolidation. Put another way, both Trump and Sanders are unlikely to have emerged as robustly and credibly as they did, or to have found such significant political space and momentum, if the U.S.’s two dominant political parties and their establishment figures were not so significantly misaligned with a divergent or repolarized national culture and electorate. This new post-infotech, post-recovery, and post-globalization environment is one more preoccupied with economic security, alternatively via either cultural primacy or inclusiveness, than either party had realized in earnest (see Michael Lind’s excellent article, Future of American Politics, for a discussion of these trends). While similar dynamics are underway in many countries today, now and of course in all times to some degree, the case of the U.S. is unique and especially illustrative in some ways. First, its persistent two-party political system quintessentially embodies and institutionalizes the natural conservative and liberal forces at work in all countries, multiparty and single-party alike, and really in all complex social settings. Second, as the world’s leading or at least most watched country in many domains, the U.S.’s political machinations are observed, reported on, and scrutinized like no other country in the world today. Given this, the currently quite polarized and habitually dualistic institutional politics of the U.S. can offer a distilling window into societal political dynamics more generally, and provide an opportunity to understand these dynamics more plainly and fundamentally. In particular, and as my title suggests, I would like to use current U.S. political events as an opportunity to specifically explore a simple but powerful model of two distinct orbits, axes, or alliances in politics, one that substantially describes social life around the world and even across history. You may find that the model can help you to untangle and make better sense of political trends and gyrations around you, over time and wherever you are. The model clearly describes core dynamics at work in the current U.S. Presidential election, but appears generalizable to many modern electoral cycles. And it may even describe the essential foundations of most or all political systems and the innate forces at work within them, resulting from naturally varying personal viewpoints and areas of concern. As you can see in my attached graphic (click to enlarge), the model begins by considering relative income or social power and political liberality or openness. Based on extensive research by both social scientists and psychologists – see here and here for two of many examples – we have good reason to believe that personal wealth or power and liberality, or openness to change and novelty, are significantly unrelated to one another. There are wealthy liberals and poor conservatives, and the reverse, and the proportions of underlying liberal and conservative attitudes in many countries appear to roughly follow a bell curve or normal distribution at all income or power levels. That said, it is important to emphasize that the specific content of personal attitudes and political positions is often quite relativistic, distinctive, and idiosyncratic. This natural fact of perpetually relativistic and historically-situated values and preferences – that is, the reality of varying political content – can obscure larger and far more stable patterns of conservative and liberal human outlook and predisposition, and can make fundamental or natural political and social dynamics more difficult to perceive and understand. In any case, the evenly spaced dots in my graphic, slightly larger in the center of the chart, are intended to represent the generally dispersed range of background views in any social group, irrespective of income or power. Importantly, while political or social views are naturally diverse, you might never sense this by looking at the politics of many countries – and notably the U.S., with its entrenched two-party political system. And this is especially true, in all cases, during economically stressed and/or politically charged times. Despite diversity and independent-mindedness in people generally, political parties naturally evolve and work to coalesce these views into specific, appealing or mobilizing, and fairly predictable dominant coalitions, or negotiated sets of positions among people with naturally diverse interests and views (and always more so than is, or even can be, apparent in condensed party platforms and core themes and memes). In two-party political systems, multi-party systems with strong governing and opposition coalitions, and single-party systems subject to significant internal division, this process can become especially polarized or divergent, with less apparent or institutional middle ground and diversity than likely exists in fact at a personal or social level. But in all cases, regardless of the number of parties and coalitions that emerge in a social system, it can be helpful to understand that there is a natural and basic tension in political systems between people who are broadly conservative and liberal, often resulting in two general, dominating, and recurring patterns of political affiliation. My model summarizes this important idea by describing two basic orbits in modern political life, orbits that notably lie perpendicularly or in opposing directions along the model’s wealth and liberality dimensions. This two-orbit or folded figure-8 pattern will be immediately familiar to students of complexity science. 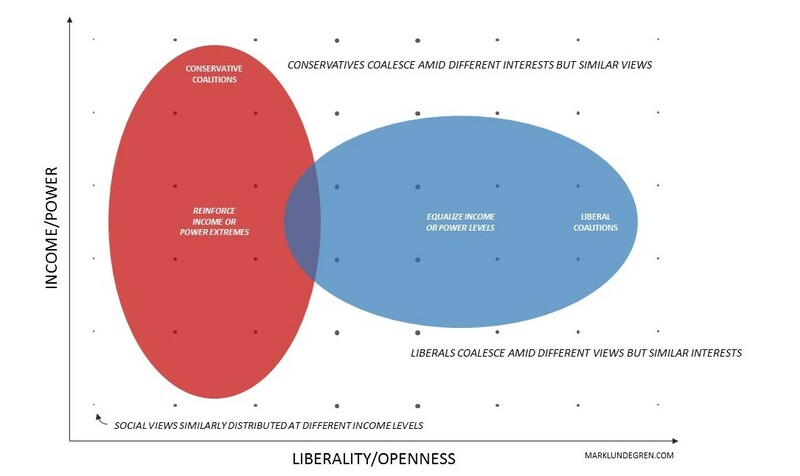 As you can see in the graphic, the conservative orbit or axis (in red on the left side of the chart) is one that vertically spans and draws in people with relatively common views but often very different incomes – and thus often very different material interests. In the model, conservative coalitions are understood to be broadly inclined to protect historical or current order and to resist or slow political change, if for different reasons – notably, with poorer coalition members seeking to assuage fear and insecurity, or acting without exposure to liberal society, and wealthier ones attempting to maintain or increase their immediate social dominance and psychological sense of security. The other, liberal orbit or axis (in blue on the right side of the chart) is very different. It horizontally spans and draws in people with different degrees of liberality, but a common discomfort with divergent income and social power overall. Such liberal coalitions are understood in the model as generally progressive and inclusive, and thus extending to the poor and wealthy, but also inclined to promote equalization of economic power and social conditions. And though the specific primary issues or views of liberal coalition members may differ more than in conservative coalitions, liberals commonly see their coalition, and progressivity or openness overall, as serving their basic interests and preferences – and notably in the face of reactive, parochial, and insular social forces. Of course, in this model as in life, many personal views or issues and specific political concerns do not fit neatly into these two general political orbits. But regardless of the number of personal views, or political parties, all are understood in the model as ultimately having to choose a variation on these two basic orbits or general patterns of coalition – conservative and buttressing or liberal and accommodating – if they are to participate or be relevant politically over time, and especially in divergent or polarized times. I would encourage you to consider this simple but potentially quite powerful model of natural political dynamics. The case of the U.S.’s current political divide seems a clear example supporting the model, and I expect it applies to many or even most modern political systems. If you want to explore this latter idea, you might plot the main demographic components of the major political parties or factions of other countries against the models two dimensions and see how well (or poorly) they align with the idealized conservative and liberal orbits. Let me end our discussion by pointing out that my two-orbit model may be predictive and not merely descriptive. For example, it suggests that as societal groups become more equal, or as social power in groups is more evenly distributed, we might expect not only fewer highly disempowered and empowered people, but also comparatively more liberal political institutions and agendas as well. In these cases, though the proportions of comparatively conservative and liberal attitudes may not change within the group, the center of political content or social policy moves toward states of greater liberality and openness. Looking across the world today, this seems a fairly compelling proposition, especially in developed conditions – or in countries where there is both relative equality and the absence of disheartening, dispiriting, or parochializing poverty. To see this important natural linkage between social equality and political (personal) openness, separately compare the developed and developing country lists in Wikipedia Income Inequality and Democracy Index. Tell others about Mark and the transformative Natural Strategy method! This entry was posted on June 21, 2016, 8:02 pm and is filed under Strategy Insights, Strategy Practices. You can follow any responses to this entry through RSS 2.0. You can leave a response, or trackback from your own site. Unlock Your Natural Potential With The Seven Keys – Click To Explore! Subscribe To receive new posts from Mark! How Naturally Progressive Are You Each Day?